To all those people asking, "Should I put a rug in my kitchen?" the answer is a resounding "yes" — at least as far as we're concerned. More often than not, a kitchen has tons of neutral colors and minimal free wall space, so it can be one of the hardest rooms to personalize. A stylish, colorful rug can add some much-needed contrast to the space so you can make it your own. There's also an argument to be made in terms of comfort and safety. 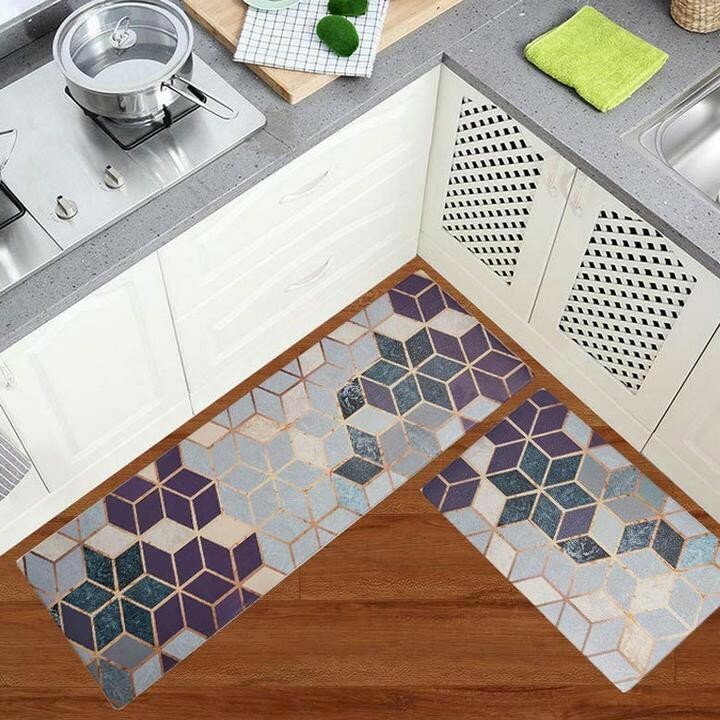 Not only will a kitchen rug cushion the bottoms of your feet while you cook (or clean up), but it'll be warmer underfoot and it'll absorb any liquid spills so you don't slip. That said, just like the rug under the dining room table debate, people are usually wary of textiles in the vicinity of potential wine stains, crumbs, and spills. 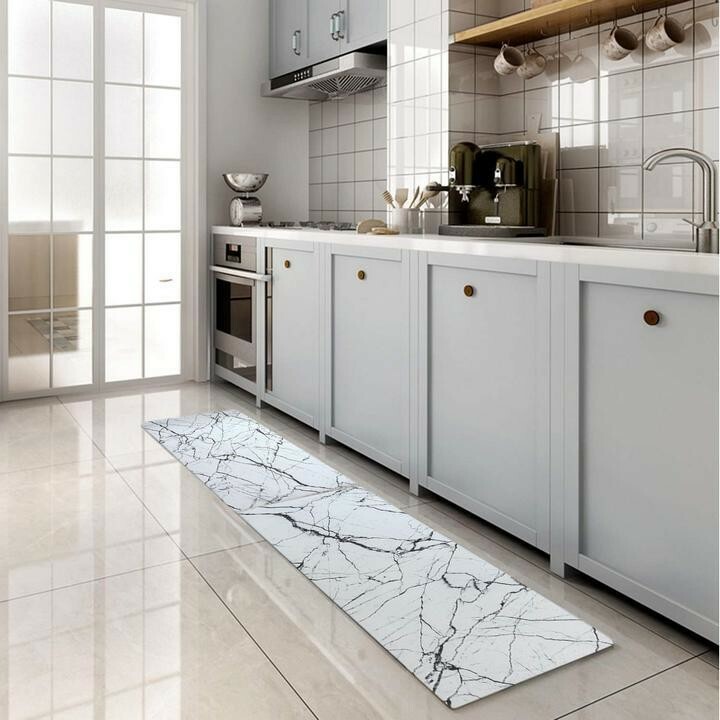 No problem — as long as you choose the right material and pile, your rug will be able to stand up to virtually anything your cooking space throws at it. When choosing the correct rug for your kitchen, look for fabrics like nylon, polyester, polypropylene, and cotton, which are durable and easy to keep clean. In fact, indoor-outdoor rugs (LINK TK) are especially great for your cooking space, because they're built to brave moisture, stains, and high-traffic. Now onto pile and size. Low pile-rugs with closed loops are definitely better for this particular room; They may not be as soft, but they're certainly easier to clean. (Imagine trying to vacuum cookie crumbs out of a shag rug. Yeah, save that style for the bedroom.) When determining the size and shape of your kitchen rug, it's really all about preference and usable footprint. Runners are especially popular in kitchens because they can stretch along cabinets, in between islands, and underneath counter-top stools — but if you've got the room for a circular or rectangular rug, by all means, use it. Alright — maybe we won you over, or maybe you were on board the whole time, but either way, now it's onto the fun part: Check out these 12 rugs that'll liven up your kitchen and help you personalize the space. All of them are durable, washable, comfy, and worthy of your Pinterest home-inspiration board. Multiple color choices, various size options, and an unbelievably reasonable price tag? It's no wonder the Ottomanson runner is our number one pick for kitchen rugs. Despite the fact that this rug looks and feels like fabric, it's actually made out of premium nylon, which is resistant to stains, easy to clean, and extremely resilient. This particular rug also has a rubber backing, which helps to further cushion your feet and prevent slipping and sliding. Reviewers say it's "heavy enough that it does not roll up on the ends or crease when you store it," and it helps to keep the kitchen both dry and clean because it "catches the drips when [you] use the sink or fill the dishwasher." All six styles are entirely solid, so you can add a pop of color in your kitchen without having to worry about clashing patterns. 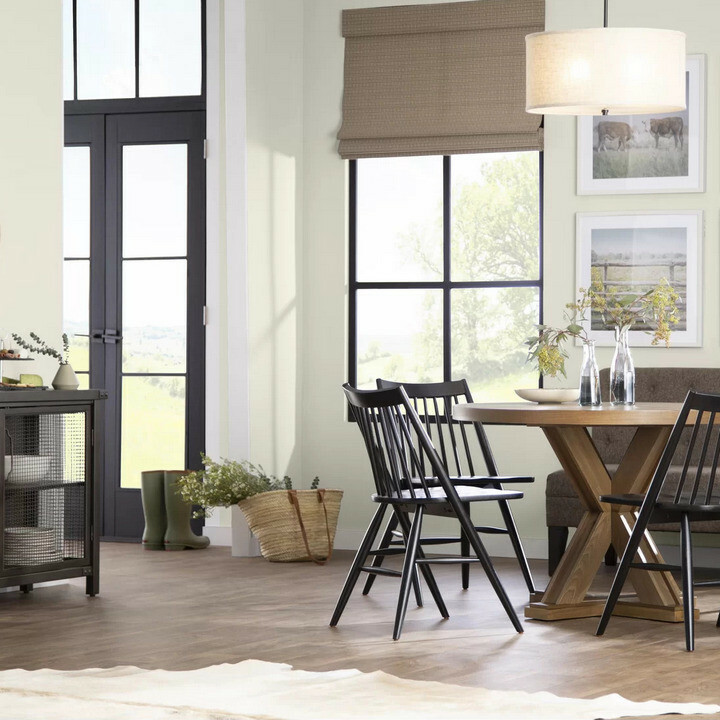 The sizes range from a 12-foot runner to a five-by-six rectangle, so you've got plenty of options in plenty of spaces. 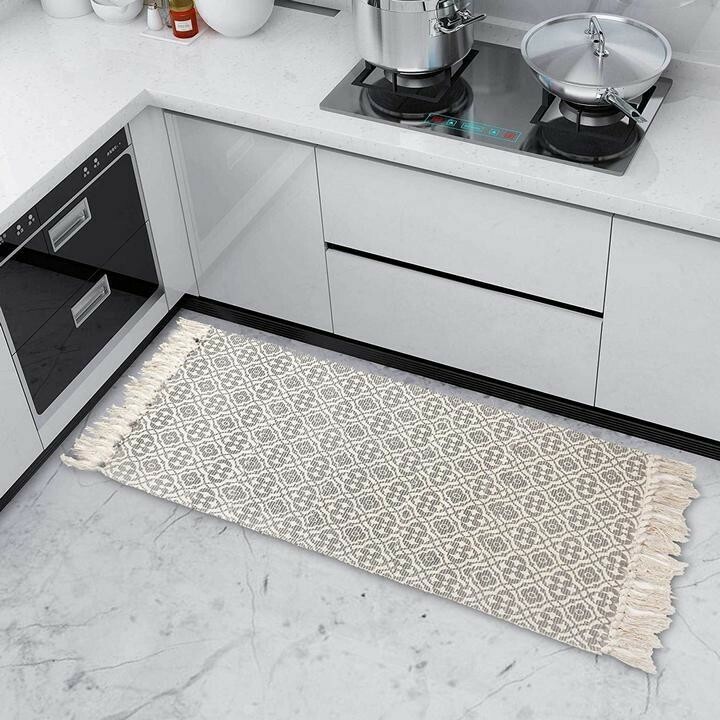 The Oberle kitchen mat from Brayden Studio is a little bit pricier, but according to its 4.8-star rating (yes, out of 5), it's well-worth the splurge. Reviewers say it's "perfect for in front of [their] kitchen sink" because it's non-slip, stylish, water-absorbent, and actually washable. That's right — when this pick starts to accumulate crumbs, stains, and water marks, you can toss the entire thing in the washing machine, despite its non-skid backing and surprisingly-soft pile. 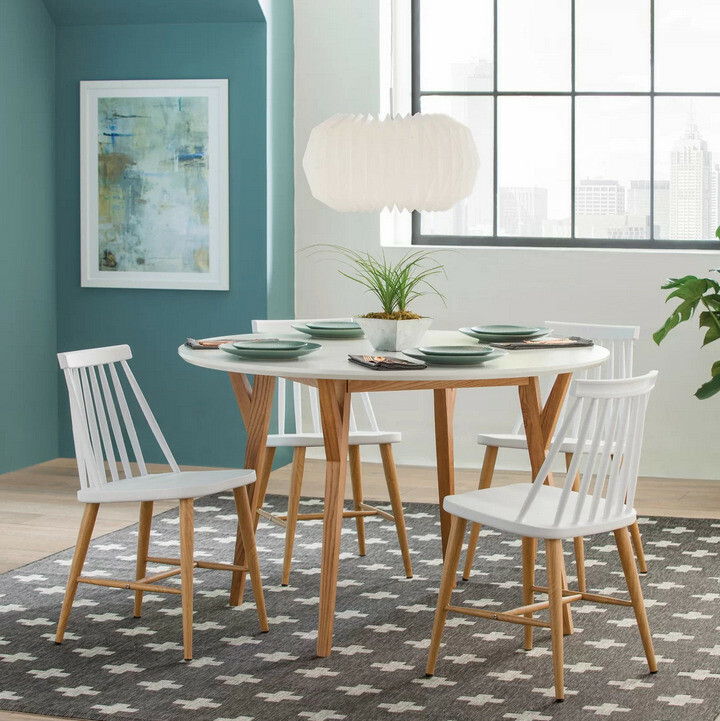 This rug is a great option for someone who's looking to stay within a simple color palette, but is still looking for a piece that catches the eye and breaks up the monotony. You can get this one in three sizes (all runners), and they're flat enough that they won't obstruct the opening of doors. When placing rugs in entryways, kitchens, and dining rooms, experts suggest busier patterns, which will help to disguise dirt and crumbs in between cleanings. 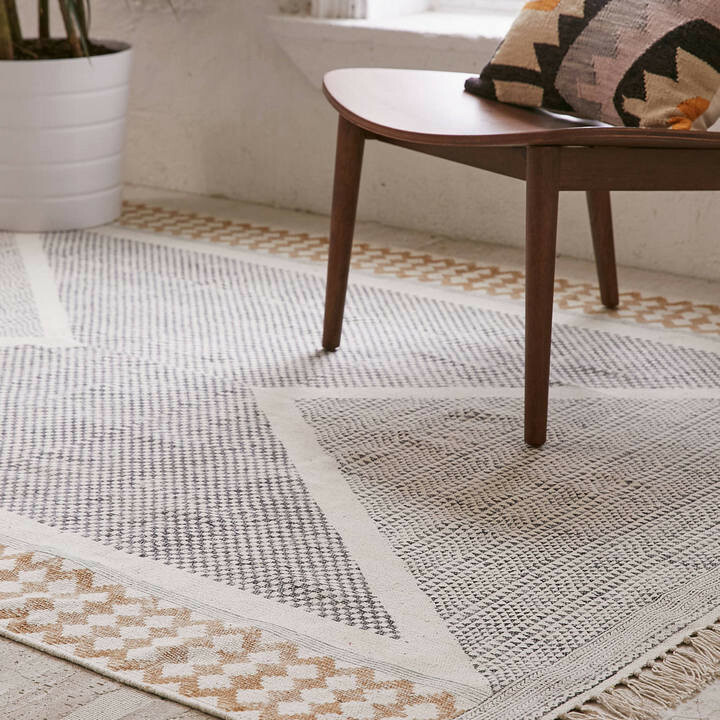 This Calisa rug from Urban Outfitters is patterned, but not overwhelming. Its low-profile weave and charming tassles add texture for a homey, traditional feel. That said, the geometric design is particularly in right now, especially alongside the earthy, muted colors. Speaking of colors, this rug can pull to multiple palettes because of its mix of gold, dark gray, and almost-white — all of which are considered the top color trends of 2019. Since it's made entirely from cotton, it's durable and easy to spot-clean should something spill. "It’s lovely and has a distressed, pre-worn in look to the print," one reviewer says, while another raves, " I always get compliments when guests come over." One of the many reasons why people opt for a rug in the kitchen? Comfort. If you dread dish-duty because of aching arches and a stiff back, this is the pick for you. The Torrick kitchen mat has a woven-vinyl exterior, so it wipes clean while still resembling textile. That said, the real selling point is the interior, which is filled with memory foam to cushion your feet and lessen the strain on your knees and back. 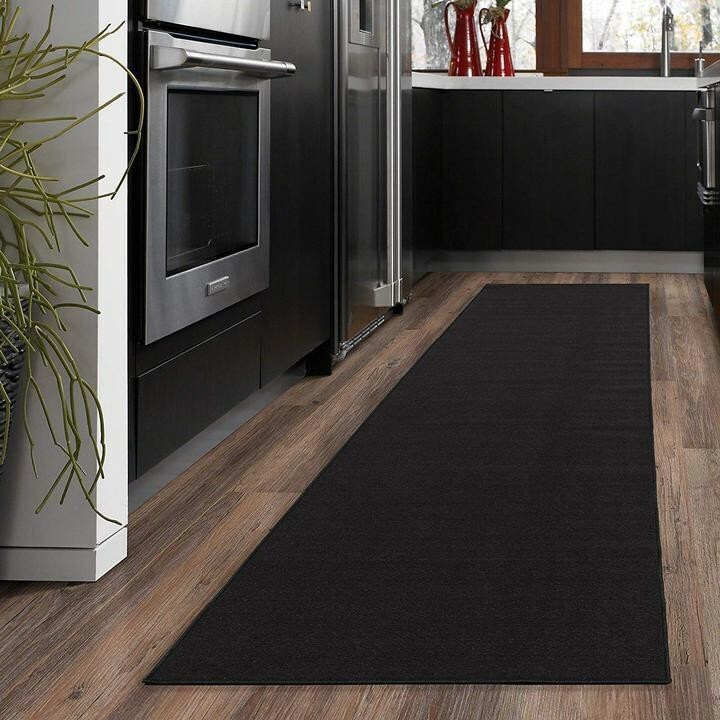 "Not only does this extended length kitchen mat look beautiful," one reviewer says, but "it is very practical. Extremely comfortable while standing at the sink, and all spills wipe off easily! I love it so much, I ordered the smaller size to keep cat bowls/food messes orderly." 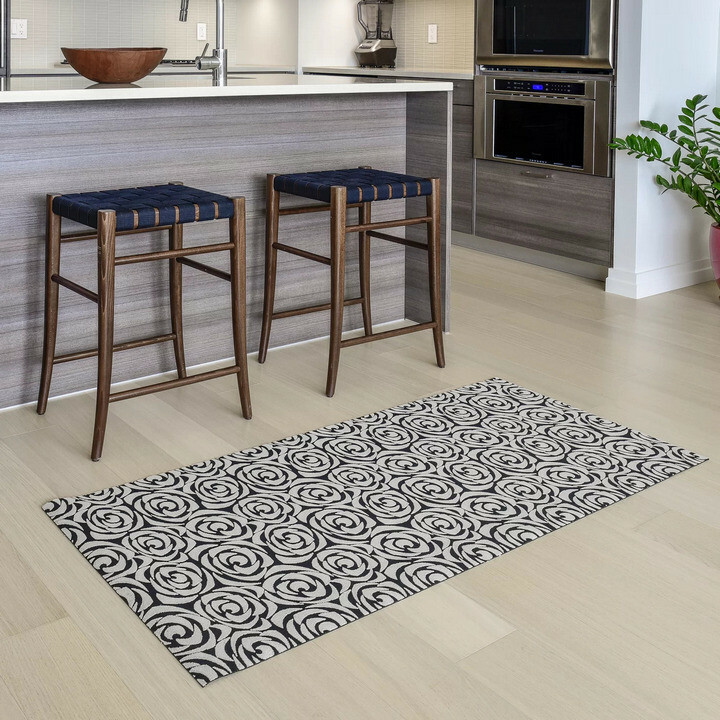 This rug features clean, contemporary lines and various shades to tie in all your colorful kitchen accents — but if you prefer something a little more subtle, it also comes in black wicker, brown wicker, red wicker, brushed charcoal, coco weave, or gray lines. For those with an eat-in kitchen, underneath the table is prime real-estate for a rug — so long as it's made from the right material. 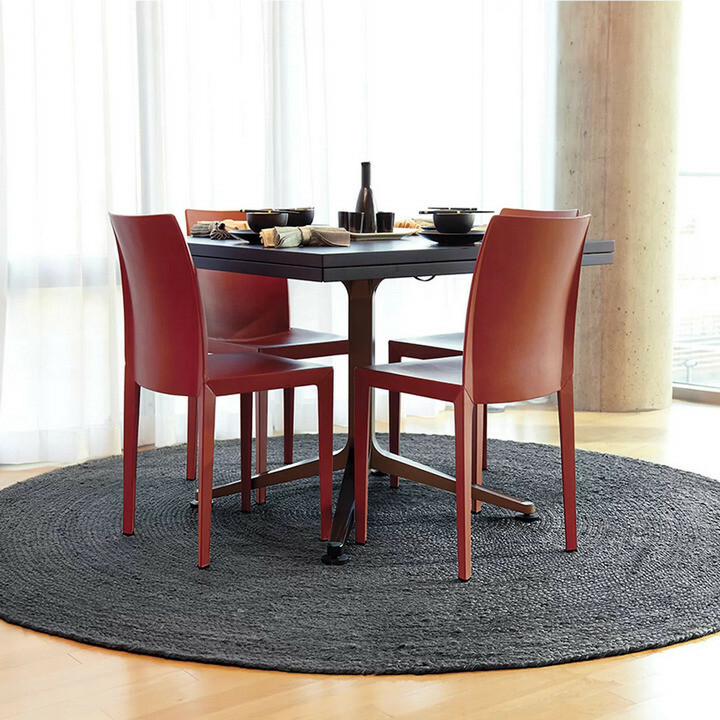 Thanks to its 100-percent polypropylene construction, the Umbria rug can be used both indoors and out. (Polypropylene is a synthetic material that's strong, colorfast, and resistant to stains and mildew.) For that reason, it's an especially great pick to soften your eating area, even if you have kids. The cross pattern is definitely bold, but since this rug is primarily charcoal gray, it's neutral enough that you can pair it with bold cold and warm palettes. It also hides stains relatively well (even though, according to reviewers, it "still looks brand new" after eight months of traffic). Get it in six sizes, including five rectangles and a runner. For a more traditional look, there's this pick— and it even comes in a set of two, so you can put the second in your powder room or laundry area. It's light and airy in both its appearance and its texture, thanks to the diamond trellis pattern, fringe tassels, and all-cotton construction. When it starts to get dirty, you can throw it in the laundry in a mesh bag, and it'll come out looking like new. This pair comes in five different colors, all in gray and beige hues that're easy to match. You can even roll them up for storage, unlike most other kitchen mats. "Love the vintage look!" one reviewer writes. "Great addition to our home." This pick utilizes traditional Zapotec patterns, but adds a contemporary flair with its bold design and stark black and white palette. Choose a longer runner, or mix and match your accents —like the above picture, which combines the Rombo rug with a La Cima for a more abstract appearance. Are they cubes, six-point stars, or diamonds? However you see it, this design from U'Artlines adds some eye-catching contrast to your kitchen. The set comes with two runner mats (30 inches long and 55 inches long), so you can line your counters, highlight your island, or protect the floors underneath your sink and dishwasher. The non-toxic PVC material also provides some cushioned comfort as well as non-slip security, and stains and water will simply wipe away with a paper towel. The grays, emerald greens, and metallic golds in this rug are reminiscent of the art deco era (which is making a comeback, by the way), but this rug has a modern feel nonetheless. Thanks to the various hues, it'll work well in a light-colored kitchen as well as a dark-colored one. At Lonny, we've expressed our love for natural fiber rugs, and that obsession isn't going anywhere. Why? These pieces offer an earthy, homey touch to any room, but they're also eco-friendly, resilient, and easy to keep clean. The Sarina is hand-braided using natural jute, which is a lovely material choice for various reasons; not only does it control static and insulate the floor, but it's stain-resistant and suited for high-traffic areas. You can purchase this rug in either charcoal gray or tan, and it's available in three round sizes and one oval. Currently, it has over 300 reviews and a 4.5-star rating. People say it's "surprisingly soft under foot" and shows "almost no wear" a year after purchasing, even in households with dogs and children. Before delving into the details of this gorgeous rug, it's important to note that cowhide and water don't mix well. For that reason, the Lettie cowhide rug is best-suited for those sparse in-between areas — for example, to bridge the space between the counter and the table, or to give that empty corner a nook-like feel. With this rug, you're getting a real, hand-woven cowhide in your choice of 14 different colors and patterns. Its soft texture and ample pile will give a rustic and cozy ambiance to your kitchen. In fact, some argue that your kitchen space is likely missing a much-needed cowhide, because it'll add texture, shape, and warm tones to an area that's typically saturated with hard surfaces and bleak colors. This one is for households that don't hold back. (We're looking at you, moms, messy chefs, and pet-owners.) 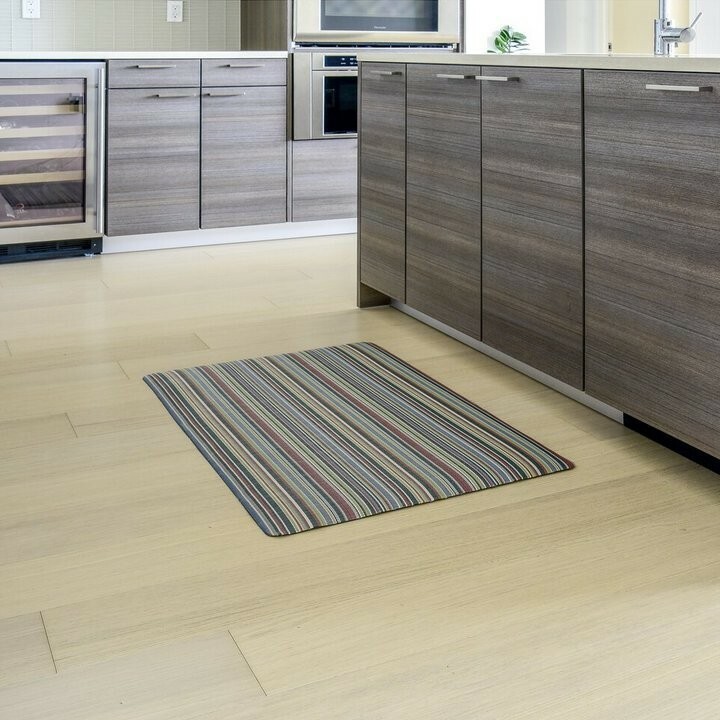 The Kimode kitchen rug can handle virtually any amount of water, dirt, and wear and tear. That's because it's constructed from quality PVC leather, high-resiliency rebounding foam, and non-skid leather backing. Even oil and pet hair wipes right off. Despite the fact that it's built to last, this mat has ample cushioning and a classy marble pattern — the same one that's infiltrating the interior design world in the form of wallpapers, linens, and kitchenware. For that reason, it'll work with virtually any other colors, and the five size options ensure that you find the right fit for your space. It even "looks great in the kitchen under the barstools," one reviewer says — and it'll help to prevent the chairs from scratching the hardwood. 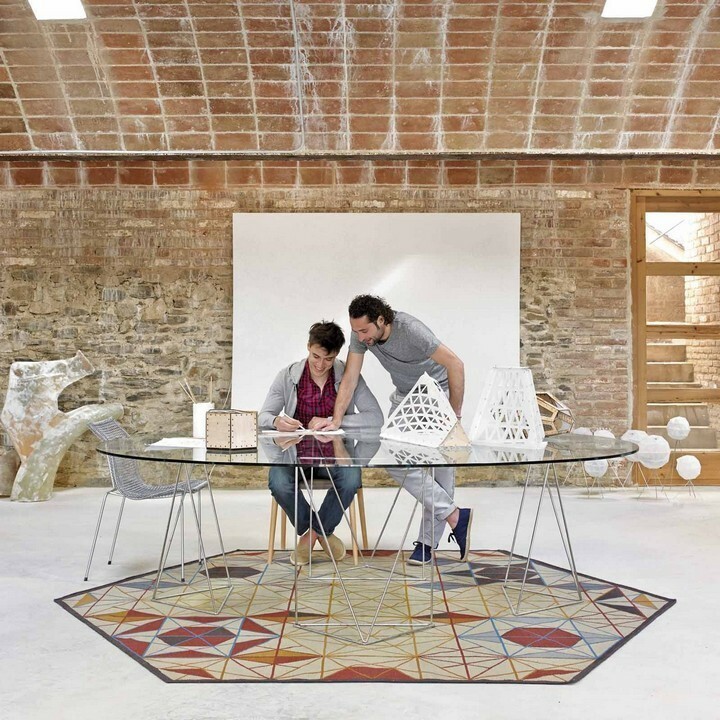 Finally, if you're looking to make a statement, the Emblanc Hexa rug is unlike anything else out there. This pick was designed specifically for Gan Rugs, which aims utilize pieces in order to build a complete living space, rather than to merely cover a floor. It engages the eye with sharp angles and hexagons inside hexagons, and it's definitely worth the splurge in terms of originality and quality. Despite the varying colors and bold lines, this pick still manages to retain a soft, calming feel — partially because of its wool construction. The fibers are hand-woven into a durable kilim style that can be spot-cleaned or professionally dry-cleaned to remove stains and dirt. Thanks to its brilliant use of primary colors, this rug will have a major impact on your space and tie in various accents around your cooking area. 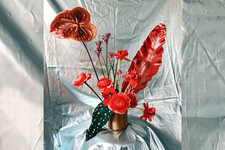 Place it under a table, in front of a window nook, or in the center of a wide-open kitchen. 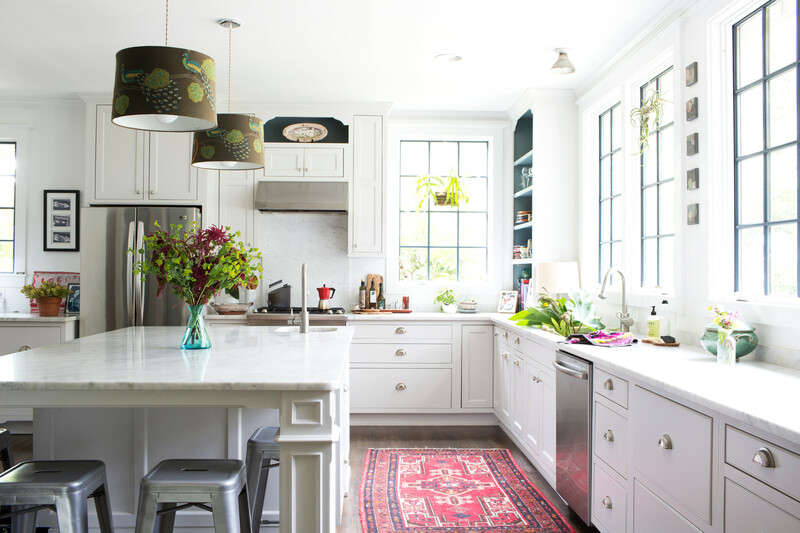 We hope you found the perfect rug to cushion and warm your kitchen space. So you know, Lonny may collect a share of sales from the links on this page.